The consideration of cultural factors in international agricultural research are receiving more attention. Increasingly in PNG, the national agricultural research organisations are recognising the importance of socio-economic and cultural factors for explaining the low adoption rate of good farming practices and the poor uptake rate of new technologies in the cocoa, coffee and oil palm sectors. At the Crawford Fund Parliamentary Conference, a number of examples were given where specific considerations of the local community’s needs determined whether a project succeeded or failed. 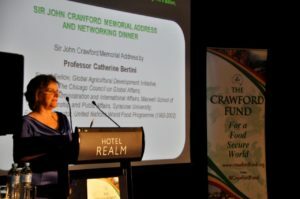 One memorable example was given in the Sir John Crawford Memorial Address by Catherine Bertini who related her experience during a visit to rural Angola. The community was ready to plant, but they needed hoes. There were around one hundred long-handled hoes leaned against a fence. When asked why they weren’t being used, she was told they were “male” hoes, provided by an NGO. She learned there was “female” hoe which had a shorter handle and was more pointed. These hoes enabled the women to squat which was easier when working in the fields with a baby on their backs. Socio-economic research is new to many agricultural research organisations and most researchers have little experience in this type of research design, data analysis and reporting. To address this emerging need, research design and data analysis were covered in two earlier Crawford funded workshops. 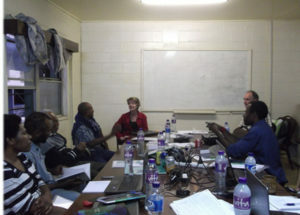 The WA Committee of the Crawford Fund has now supported a third workshop in research writing to assist junior level researchers from the PNG Oil Palm Research Association (PNGOPRA), the Cocoa and Coconut Institute (CCI), the Coffee Industry Corporation (CIC) and the National Agricultural Research Institute (NARI) to develop good writing skills to write up the findings of their social research. Participants learned how to write up qualitative and quantitative aspects of their social research for publication. The course involved group and individual exercises to give the trainees practice in using the writing techniques they were taught. 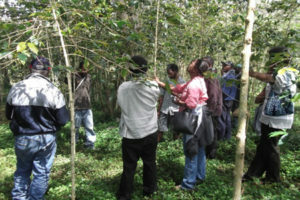 On the third day of the workshop, participants had a field visit to a coffee growing area in Bena Bena which was one of the field sites in an ACIAR coffee project. Several research articles have been written and published since completion of the course.